You will also find some settings for changing the behavior of the main menu, like changing the color of the flashing or disabling it. The news is displayed from the website at MeshMaker.com. So if there is some news or important information about a program that wasn’t covered at the time of release I can now update you in real time. 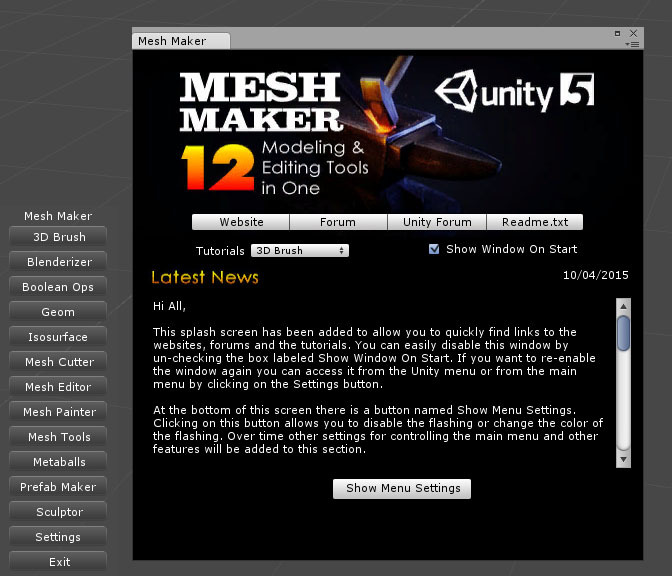 The programs have been released for versions 4.6.2, 5.0 and 5.2.1 of Unity. Unity is no longer supporting inline shader code, which resulted in pink lines in the latest versions, so all of the programs have been updated to use a separate shader. The following is a list of most of the changes that come with the update. I will continue to add the new features for Mesh Editor, such as edge splitting and filling holes, but I wanted to get this update out asap.